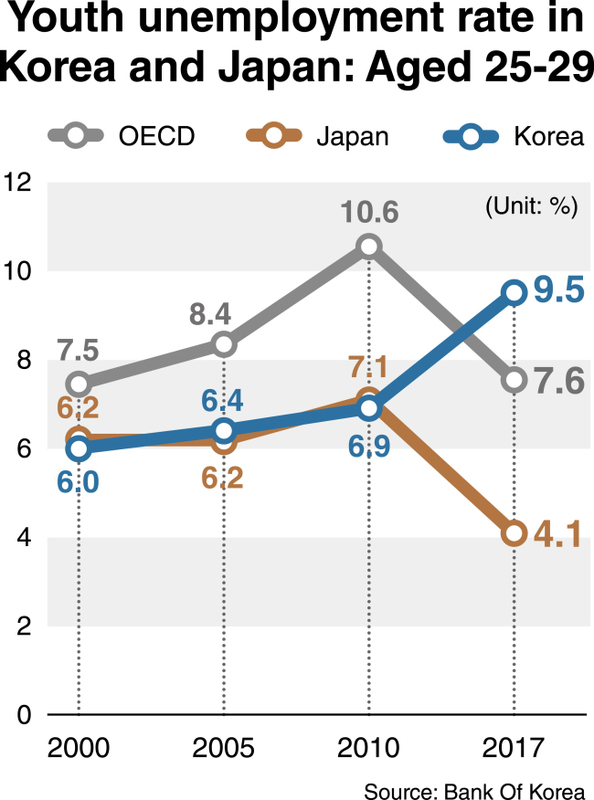 The unemployment rate for South Koreans in their late 20s has escalated rapidly since 2010, and 2017 saw the highest increase since 2000, according to data released by the Bank of Korea. The proportion of jobless Koreans between the ages of 25 and 29 hit 9.5 percent as of 2017, as compared with only 6.9 percent in 2010. That number has risen consistently since 2000, two years after the financial crisis hit the nation. Japan, where the economy is recovering and the working-age population is on the decline, has witnessed a significant drop in unemployment among people aged 25-29 since 2010. The number recorded 4.1 percent last year, less than half the corresponding figure in Korea. The report attributed the disparity between the two countries to a lack of quality jobs in the Korean labor market, where there are increasing numbers of educated job seekers, as well as to the wage gap between employees of major companies and their counterparts in smaller enterprises. Other factors mentioned in the report were the continuing economic slowdown, the rapidly aging population and the rising number of part-time and low-wage jobs in Korea.